Suitable hard disk type: 1.0" or 1.6" height, and 3.5" H.D.D. 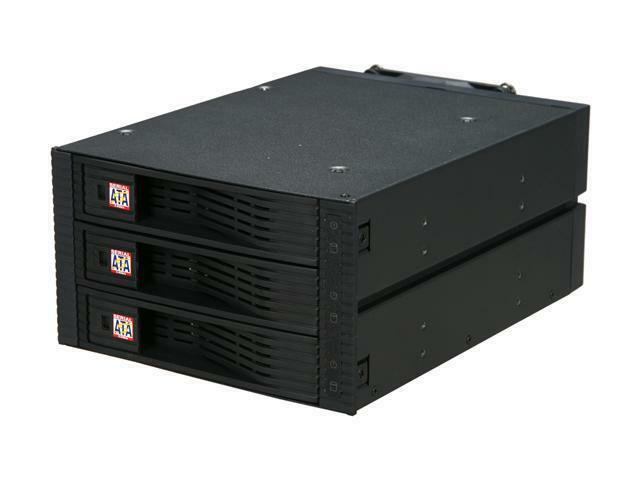 Pros: Using on 4U Rack Mount Servers. Easy removal and replacement without pulling the server. I have these on every server now. Makes repurposing and expanding VMs a snap. Extra HS cooling fan us great for the drives as well. Cons: I can think of none. Other Thoughts: I would recommend this for any PC or server. Pros: Very convenient system; just pop in a bare HDD and go! Ability to install/remove 1 drive at a time (has 3 separate doors and locks). Don't have to mess with any cheap caddies. The construction is pretty solid and does not feel flimsy. Other Thoughts: Installation was flawless in my SilverStone case. Pros: * Fits three 3.5 inch hard drives in two 5.25 inch bays. * Trayless, and works well! No shuffling hard drive caddies. * LEDs for each drive show power and disk access. * Each bay can be locked. You really don't want to pop a drive out of a running system, in the best case this would trigger a many hour mdadm rebuild. * I've read other places that some of these type of trayless multi-drive hot-swap enclosures can have connection problems, but in my experience this one does not. * Removable fan, in case you want to get a quieter one or it dies. The stock fans have worked fine for me. * Goofy "Serial ATA 3.5 Gbps" logo on the front. I'm fairly certain that these will also support 6 Gbps SATA. Other Thoughts: I've been using two of these enclosures for about six months and I really love them. It sounded to me like the other commenter (talking about the "design flaw") just had a compatibility problem with his case or his motherboard - these work absolutely fine for me. Pros: Works just as you would expect. Cons: Installation is a major hassle due to a major design flaw in this model. Other Thoughts: I considered removing 2 stars from the design flaw. Like the other reviewer I also own the 4x3. I purchased 2 of these because I wanted to go from 4 hot swap bays to 6. But they are not identical in design. On the plus side, these units have larger fans. The 4x3 has aluminum sides, these appear to be hard black plastic making them much harder to slide in. But the major issues is that the rear panel appears to be designed and mounted upside down. What this means is that the power and data connectors are flush against the motherboard rather than away from it and easily accessible. So, if anything sticks u from the motherboard like RAM or heat sinks, you are going to have trouble accessing the connectors. A 15 minute job took an hour.. This would probably be easier if installed when building the system but adding them in was a major hassle. Their other model does not put the connectors next to the motherboard. Other than installation, they work fine and the drives slide in and out easy as you should expect. Pros: Excellent design when it comes to swapping drives, no trays or anything else needed, just slide a drive in and click it. The LED lights look good and work really well displaying activity. This cage is by far the best looking one I've seen. Cons: My unit has two fans and both died within a few months, oh well it still works since my case has pretty good airflow. Other Thoughts: I own the 4x3 instead of this 3x2 but they are essentially the same.